Located in the Natural Reserve Park Green Valley Anhumas, the caves of San Miguel are a sight to behold! Right from the architecturally stunning visitor centre to the exciting approach towards the caves via a 200 metres long suspension track to the caves themselves, this trip is definitely worth the visit. 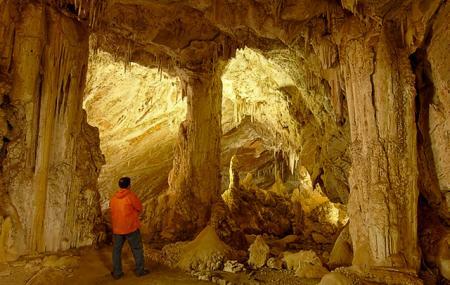 The Main Cave has many speleothems and ancient limestone formations. Throughout the guided tour, visitors get to learn about stalactites, stalagmites, coralóides, travertine and even pearls. Keep your eyes peeled, you might even spot a suidara owl! Children 5 years and below are not allowed on the tour. The tour is not recommended for people with labyrinthitis or limited mobility because a lot of walking and climbing is involved and there are no hand railed staircases. Please contact local tour operators for information about guided tour timings. Transportation provided by tour operators at additional costs. You can also hire a moto-taxi. How popular is Gruta De Sao Miguel? People normally club together Gruta Do Lago Azul and Projeto Jiboia while planning their visit to Gruta De Sao Miguel. Our experience here reflects the fundamental change to the Bonito experience during the past 20 years. In 1994, on my first visit to the town of Bonito, in all the attractions, including cave visits, we had to sign off a waiver of responsibility to the business owners and then enjoyed the attraction however we could. It was cheap, but if you had an accident, well, tough luck - you signed a waiver after all. Nowadays we certainly pay much more, but fill out an insurance form and the visit is closely supervised in the safest way possible. Unfortunately, today we found that out in the worst way possible. My wife slipped on the stairway down to the entrance of the cave and broke her wrist. The staff was quick and professional to perform rescue, first aid and accompany us to the hospital. They even paid for the meds and arranged an appointment with a traumatologist on the same day. So, please, watch your steps. But do know that should something bad happens, the business will assist you to the end. Amazing experience, great guides and the infrastructure is very good! Would always recommend visiting if you come to Bonito! Great cave and infra on the place. Amazing Natural Beauty !! Will never find something as good as this anywhere else . Problem however is that the guides here do speak english , however it is still worth the visit ! !